Accurate measurement of laser irradiance on a target will provide a valuable diagnostic tool for assessing the effectiveness of high-energy laser weapon systems. Optical Physics Company (OPC) developed a design of an irradiance imaging system (I2S) capable of measuring the high-energy laser irradiance on a remote, un-instrumented target. OPC has completed several scaled laboratory demonstrations to confirm the operational concept of the I2S, and showed that the performance is consistent with analytical prediction. Furthermore, OPC has verified that the concept of using a probe laser to measure the target bidirectional reflectance distribution function (BRDF) is consistent with existing backscatter data. The operational flexibility of the proposed system, which can be used on un-instrumented targets, can provide a higher fidelity test program and potentially reduce the testing cost. Accurate measurement of the HEL irradiance profile on a target will also allow anchoring of the system performance model, which will then permit extrapolation of the system performance to various conditions that are different than the test environment. Finally, by providing direct irradiance on target measurements, the I2S system can also be integrated into the weapon system and provide real-time performance optimization. Accurate statistical model of atmospheric turbulence around the world will allow better performance prediction and modeling of optical systems that rely on precise wavefront control. 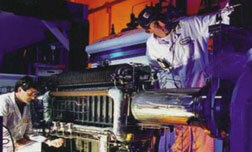 These optical systems include communication systems and high resolution imaging instruments. Commonly used turbulence models do not account for the spatial anisotropy and inhomogeneity of the observed turbulence profile and conventional turbulence parameters (e.g., Fried’s coherence length, isoplanatic angle, log amplitude variance, and Greenwood frequency) do not capture enough information to adequately characterize turbulence along a propagation path. Moreover, current statistical models do not adequately address the inhomogeneity and anisotropy of the turbulence profile and there is inadequate data available even to begin to model them. A three dimensional turbulence profiling system can be an effective tool to measure real turbulence leading to accurate statistical models that can be used to evaluate and optimize the performance of high energy lasers (HEL) and imaging systems in the battlefield. OPC has developed and demonstrated such a Three Dimensional Wavefront Sensing (3D WFS) Instrument that can be used to measure the distribution of turbulence over a three dimensional volume. Unlike conventional turbulence sensors (e.g., scintillometer or differential image motion sensors) which measure the path-integrated turbulence profile, the 3D WFS utilizes a tomographic technique to resolve the turbulence profile along the range and cross range directions. This measurement provides measurement of turbulence induced optical path length changes over the full three dimensions, and allows visualization of the motion of the turbulence cell. 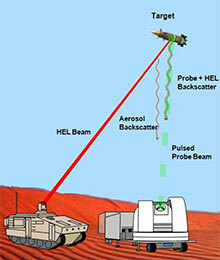 High energy lasers (HEL) can engage targets at the speed of light with high precision. For HEL weapons to reach their potential on airborne platforms, innovative testing tools and diagnostics are needed for assessing laser-target interaction and assuring maximum effectiveness.